With today’s episode of the Lawyer2Lawyer podcast, we reach a milestone: our 250th episode and the end of our fifth year of weekly shows. 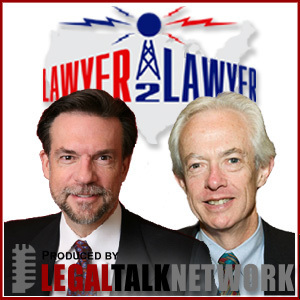 This makes Lawyer2Lawyer the longest continually running legal podcast. Our first show was on Aug. 31, 2005. Our guests for that first show were Michael S. Greco, then the newly installed president of the American Bar Association, and law professor (now dean) Erwin Chemerinsky. Over the years since, we’ve been fortunate to have a steady stream of fascinating guests, joining us from all over the world. Today’s show features two long-time podcasters to talk about podcasting: Denise Howell, host of This Week in Law, and Struan Robertson, editor of Out-Law.com and Out-Law Radio. I was fortunate from the start to partner with lawyer J. Craig Williams as a cohost. An ace litigator with a background in journalism, Craig is a master at asking the most challenging questions. Originally, the show was called Coast2Coast to reflect Craig’s base in California and mine in Mass. We later changed the name to Lawyer2Lawyer to avoid confusion with a radio show and to reflect our increasingly international array of guests and listeners. Although Craig and I cohost the program, the real brains and brawn behind the program rests with the highly talented people at the Legal Talk Network who produce the show. LTN is run by two long-time TV news professionals, Lu Ann Reeb and Scott Hess. Both worked for the CBS news outlet in Boston for many years. Our show is produced by Kate Kenney, who works tirelessly to line up guests, provide background research on topics, and script the outline for each show. Audio engineering is done by Mike Hochman, a radio professional who now attends New England School of Law. The distinctive voice that introduces the show is that of Gary Tanguay, well known in the Boston area as a TV sports anchor. My enormous thanks to all of them. I sincerely want to thank the people who listen to the podcast. There are an average of 65,000 of you every month, from all over the world. All of us involved with the program appreciate the feedback you provide and comments you offer, not to mention the time you take to listen. Please feel free to let me know of any ideas you have for guests, topics or ways of improving the show. Now on to number 251!